Mounting anger and discontent is simmering across the Arab world much like it did in the walk-up to the 2011 popular revolts that toppled four autocratic leaders. Yet, this time round the anger does not always explode in mass street protests as it recently did in Jordan. To be sure, fury at tax hikes in Jordan followed the classic pattern of sustained public protests. Protesters, in contrast to the calls for regime change that dominated the 2011 revolts, targeted the government’s austerity measures and efforts to broaden its revenue base. The protesters forced the resignation of prime minister Hani Mulki and the repeal of proposals for tax hikes that were being imposed to comply with conditions of a $723 million International Monetary Fund (IMF) loan to Jordan. Austerity measures in Egypt linked to a $12 billion IMF loan have also sparked protests in a country in which dissent is brutally repressed. Rare protests erupted last month after the government hiked Cairo's metro fares by up to 250%. Now, with economists and analysts waiting to see how Egyptians respond to this weekend’s austerity measures that include a 50 percent rise in gasoline prices, the third since Egypt floated its currency in 2016, and further hikes expected in July, Morocco may provide a more risk-free and effective model for future protest in one of the most repressive parts of the world. An online boycott campaign fuelled by anger at increasing consumer prices that uses hashtags such as “let it curdle” and “let it rot” has spread like wildfire across Moroccan social media. 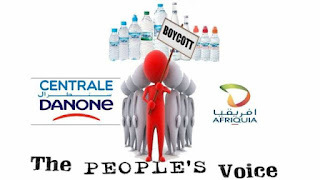 A survey in late May by economic daily L’Economiste suggested that 57 percent of Moroccans were participating in the boycott of some of Morocco’s foremost oligopolies that have close ties to the government. The boycott of the likes of French dairy giant Danone, mineral water company Oulmes, and the country’s leading fuel distributor, Afriquia SMDC, is proving effective and more difficult to counter. The boycott recently expanded to include the country’s fish markets. The boycott has already halved Danone’s sales. The company said it would post a 150 million Moroccan dirham ($15.9m) loss for the first six months of this year, cut raw milk purchases by 30 percent and reduce its number of short-term job contracts. Danone employees recently staged a sit-in that blamed both the boycott and the government for their predicament. Lahcen Daoudi, a Cabinet minister, resigned after participating in a sit-in organized by Danone workers. The boycott has also impacted the performance of energy companies. Shares of Total Maroc, the only listed fuel distributor, fell by almost 10 percent since the boycott began in April. The strength of the boycott that was launched on Facebook pages that have attracted some two million visitors lies in the fact that identifying who is driving it has been difficult because no individual or group has publicly claimed ownership. Anonymity and the virtual character of the protest, in what could become a model elsewhere in the Middle East and North Africa, has made it difficult for the government to crackdown on its organizers. Yet, even if the government identified the boycott’s organizers, it would be unable to impose its will on choices that consumers make daily. The boycott also levels the playing field with even the poorest being able to impact the performance of economic giants. In doing so, the boycott strategy counters region-wide frustration with the fact that protests have either failed to produce results or led in countries like Syria, Yemen, Egypt and Libya to mayhem, increased repression, and civil war. “While boycotts solve some of the problems of protest movements,… they also create new challenges…. Diffuse structures…limit their ability to formulate clear demands, negotiate on the basis of these demands, respond to criticism of the movement and, eventually, end the boycott. Boycotts against domestic producers are likely to face criticism that they are hurting the economy and endangering the jobs of their compatriots working in the boycotted companies,” cautioned Max Gallien, a London School of Economics PhD candidate who studies the political economy of North Africa. The Moroccan boycott grew out of months of daily protests in the country’s impoverished northern Rif region that the government tried to squash with a carrot-and-stick approach that involved the arrest of hundreds of people. Underlying the boycott is a deep-seated resentment of the government’s incestuous relationship with business leading to its failure to ensure fair competition that many believe has eroded purchasing power among rural poor and the urban middle class alike. Afriquia is part of the Akwa group owned by Aziz Akhannouch, a Moroccan billionaire ranked by Forbes, who also serves as agriculture minister, heads a political party and is one of the kingdom’s most powerful politicians. Oulmes is headed by Miriem Bensalah Chekroun, the former president of Morocco's confederation of enterprises, CGEM. “The goal of this boycott is to unite Moroccan people and speak with one voice against expensive prices, poverty, unemployment, injustice, corruption and despotism,” said one Facebook page that supports the boycott. It is a message and a methodology that could well resonate across a swath of land stretching from the Atlantic coast of Africa to the Gulf.